Manappuram Miss South India 2018 Winners List :Ms. Lakshmi Menon from Kerala won the title of Winners of Miss South India 2018. Ms. Shrisha from Tamil Nadu and Ms. Dushara from Tamil Nadu were the first and second runner up respectively. They were selected from 22 finalists from 5 south Indian states. The 16th edition of Miss South India 2018 presented by Manappuram Finance Ltd and DQ Watches, an event directed by Dr. Ajit Ravi at Gokulam Convention Centre, Kochi. 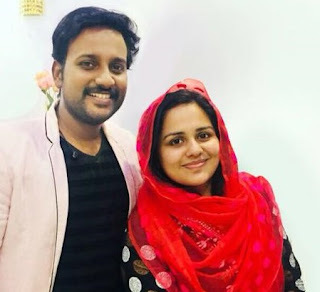 The title winner won One lakh rupees, the second runner up with 40,000 rupees gifted by Manappuram Finance Ltd and first runner up with 60,000 rupees gifted by Saara Media. The crowns worn by the winners are gifted by Parakkat Jewellers. 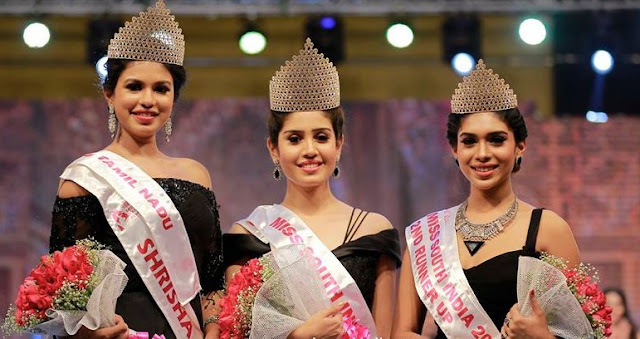 The competition which was conducted by Pegasus were in three rounds: Designer saree, Black cocktail, and Red gown.Previous year winner Ms. Bavithra crowned the overwhelmed Miss South India 2018 winner. MD & CEO of Manappuram Finance Ltd V P Nandakumar and Sushama Nandakumar crowned the first and second runners up. 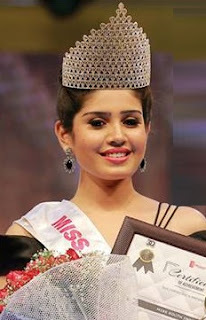 The winners of Manappuram Miss South India 2018 were decided by a judging panel comprises of Model, Actress and Writer Vanisree Bhatt, Model and Actor Rajeev Pillai, Actress Uma Riyaz Khan, Miss Asia International first runner-up 2016 Rashmi Thakur, Mrs South India 2017 Preethi Kitchappan. A panel of expertise judged the subtitles of the competition. Title winner, Lakshmi Menon(23)is from Thrissure in Kerala. She has completed B.Tech in electronics and communication from CUSAT in Kochi. She is now busy with modelling. She was the runner up of Miss Kerala Fitness and Fashion Peagent 2017-28. Lakshmi is looking forward to participate Miss queen of India 2018. She also a television host and anchor. The contestants were groomed by an expert panel of fashion choreographers and trainers– Aileena Catherin Amon (Miss south india 2015), Sameer Khan (Fashion Choreographer),Preethi Damiyan, Jithesh, Geophy Mathews (Personality Trainers), Dr Eldho Koshi (Dentist), Reji Bhaskar (fashion photographer), Vibin Xavier (Fitness trainer), Dr Elizabath Chacko (Kalpana International), Jannet (Yoga trainer).Miss Humanenesstitle will be given to that lady who amasses maximum fund from the public using the crowd funding program launched in association with Ketto Online Ventures to fund the social activities. Each and every penny gathered through this program will be used in the 100 life challenge program conceptualised by Dr .Ajit Ravi to help the financially week heart patients. Kent Constructions, Nandilath G-Mart, Kalpana International, Manappuram Riti Jewellery, Qube Watches, Unique Times Magazine, Vee Kay Vee’s Caterers, Kanyaka, XIMS, Saara Media, Parakkat Resorts, Fitness For Ever and Aiswaria Advertising are the prime event partners of the Miss South India 2018. The money raised in this programme will be used in the 100 life challenge programme conceptualised by Dr Ajit Ravi to give financial help to the heart patients. Aishwarya Setty (Andhra Pradesh ), Anagha Bhaskar (Karnataka), Dushara (Tamil Nadu), Falguni Khatod (Tamil Nadu), Hrithma Shetty (Karnataka), Lakshmi Menon (Kerala), Mahalakshmi Sathiamurthy (Tamil Nadu), Navya Ann Abraham (Kerala), Nikitha Iyyappan (Tamil Nadu), Sahana Sridhar (Tamil Nadu), Samrudha Sunil Kumar (Kerala), Sandhya Thota (Andhra Pradesh ), Shaasthra Shetty (Karnataka), Shali Nivekas (Tamil Nadu), Sharanya Shetty (Karnataka), Shrisha (Tamil Nadu), Sreya Pramod (Kerala), Sushmitha Gopinath (Karnataka), Tanurya Menta (Andhra Pradesh ), Varsha Ashok Shetty (Karnataka), Vidyashree (Karnataka), Yashaswi Devadiga (Karnataka).